Seek, look and embrace the adventure, just go explore! Come and join us for the opening of the canoe start @ the Demer. When? Sunday 17/06 from 13:00 till 17:00. You'll build your own canoe and go for a paddle downstream. A free shuttle will return you to the starting point. If you want a free parking place and going to padlle in Ghent. The best place is to go to the Blaarmeersen. Free parking, enough place to build the canoe. And you will just enjoy one of the most green places in Ghent without having all the touristic boats passing by. Also enjoy the green island at the Coupure and the waterbirds around it. We started at 'Park Lepelenburg', plenty of parkinglost (not cheap), but easy to unfold and get into the water. 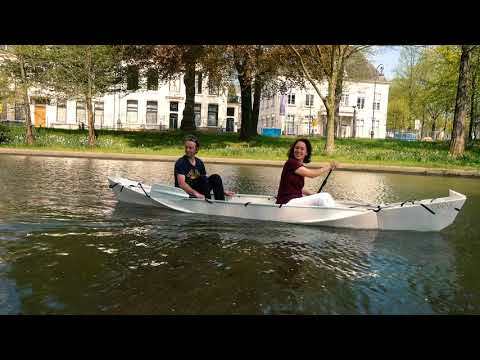 Utrecht has a lot of water, so explore!!! We took the outer water cirlce and then went into the city. Lot's of places to stop, attach the canoe and have a bite and a drink where you can. Utrecht is a perfect place to do a roundtrip, and has plenty of places for food, drinks and connecting to people. Amsterdam, one of the places you have to do by water. We did this trip during the night, just make sure you have life jackets on and a white taillight. We started at the Jordaan, also a nice place to eat something and have a trip in one of the many 'hipster'places. After a set-up of 15 minutes, we just started cruising around and doing every waterway which was nice looking. Paddling in the centre near the central station is amazing to do. Once you're in the water you see many places where you can get in and out. Which are not so visible when you're on land. Tip: put some extra lights in your canoe, while paddling. Especially during the light festival, everybody thinks you're a part of the exhibition. Wil je ook op avontuur vertrekken? Steun Dominique Laane door een kano te bestellen, en ontvang een gratis waterdicht zakje!